Aunt birthday wishes are more important than you think. Your aunts hold a very special place in your heart. They are, after all, our second mothers, so your aunt birthday wishes should be just as special. Fortunately, that's the only type you'll find here. 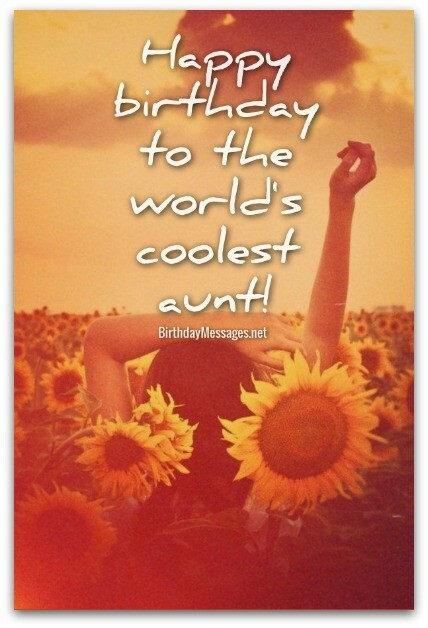 How can you tell if you've picked the best birthday wishes for your aunt? Put simply: you need to apply what I call the "Mother" litmus test. You need to pick aunt birthday greetings that are so good that they could even make your own mother feel wonderfully special on her birthday. This way you'll know for sure that you're in the presence of great birthday wishes for your aunts. Aunts are usually more than just, well, aunts — they can be your second mother, your godmother, your friend, your confidante, your older sister, you know what I mean. 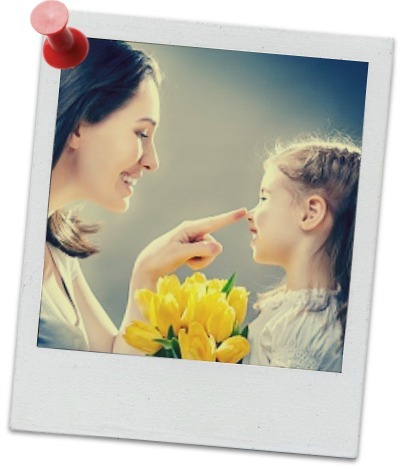 On your aunt's birthday message, you have the perfect opportunity to make her feel like a special person in your life. ...If you have an aunt with special qualities, you should really send her aunt birthday wishes that fit your personality (not a one-size-fits-all birthday wish). Athletic aunt: Pick an inspirational birthday wish. Cosmopolitan aunt: Choose a cute, clever or cool birthday greeting. 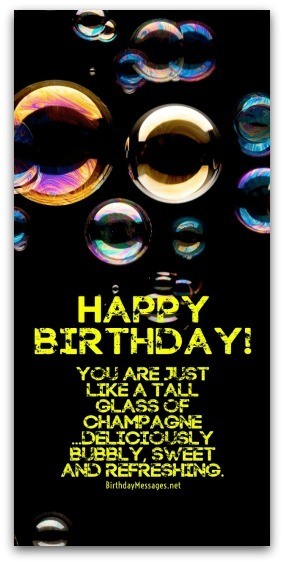 Cool aunt: Select a clever or cool birthday message. 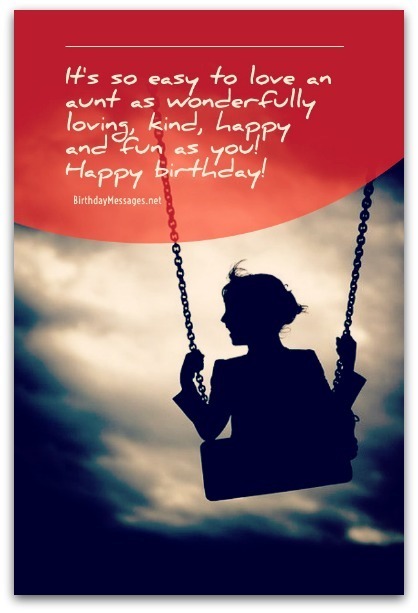 Artistic aunt: Opt for an inspirational, funny, cool or clever birthday verse. Infantile aunt: Go for a cute, sentimental or happy birthday wish. Above are only recommendations. You know your aunts best, so it only follows that you will know you've come upon the right aunt birthday wishes (when you see them). Every type of aunt birthday message you could ever find is right below, so feel free to mix it up a little and combine two, three or more birthday wishes to get to the one that fits your aunt. To the world's best aunt, may only good (no, great) things to happen to you all your days, most of all on your special day. Happy birthday! It's your birthday, so I would like to say exactly how I feel about you: I feel so blessed to have you as my aunt. I love you! May every wish of yours come true today. You are the most incredible aunt anybody could ever have. I love you. May you experience all the joy life has to offer. Have the happiest of birthdays! It's so easy to love an aunt as wonderfully caring, kind, funny and smart as you. Happy birthday! You are just like a glass of champagne...deliciously bubbly, sweet and refreshing. Happy birthday! Having an aunt like you is wonderful and rare. That makes me the luckiest (niece, nephew) anywhere. Happy birthday! Auntie, you have played a major role in our lives. We are forever grateful for the love and joy you bring every day. Happy birthday! I'm so lucky to have an Auntie like you to love me and love. Happy birthday! Auntie, you mean so much to me and the entire family. I'm glad you're in my life. Happy birthday! May this special day of yours bestow hours of joy, love, wonder and whatever else you wish for! Happy birthday, Auntie! Auntie, I wish you an incredible birthday and even more incredible year ahead! Happy birthday! Happy birthday! Your special day is the perfect time to celebrate the many special years you've been the best auntie anyone could ever have. You are the most out-of-this-world auntie in the entire universe! You boldly go where no auntie has gone before. Happy birthday! I have a long list of amazing women in my life, but you are definitely at the top of it — now and forever. Happy birthday! I've haven't told you enough that I love you and appreciate everything you've been to me, so I will say it again: I love, love, love, love you and I so appreciate, appreciate, appreciate, appreciate you. Happy birthday! There's no such thing as "generation gap" between us. You're the coolest aunt anywhere. You're so young at heart you make the rest of us younger in just seconds. Happy birthday! Auntie, you're my best friend and my partner in crime, no matter what, no matter where, no what matter when. Happy birthday! You deserve a birthday made for a queen, a regal affair filled with the best of everything. Happy birthday! Happy birthday! You brighten every room you enter, making every day with you full of your own special brand of sunshine. We are so fortunate to have you as our aunt. My cup runneth over. My heart is overflowing with love, because you, dearest Auntie, have given so much love to me all my life. Thank you and happy birthday! There are aunties and there are aunties who love us, care for us and inspire us. You've always been the second type — and we love for it. Thanks for spoiling us with your endless greatness. Happy birthday! Auntie, you're four people in one to me — you're my aunt, my godmother, my best friend and my role model. Happy birthday! You're so loving, kind, generous and patient you should write a book and call it How to Win Nephews and Influence Nieces. Happy birthday! Your aunt is super special! Here's how to make your birthday wish special, too! Not all aunties are created equal. 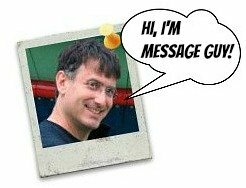 Go to savvyauntie.com to see what I mean. This visit may just turn your nice aunt birthday wishes into great aunt birthday greetings.